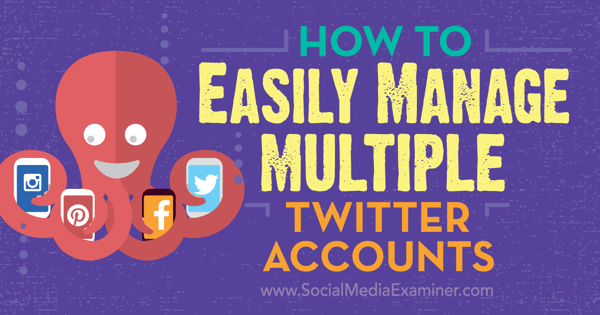 Are you managing multiple Twitter accounts? Wondering how to streamline your Twitter marketing? 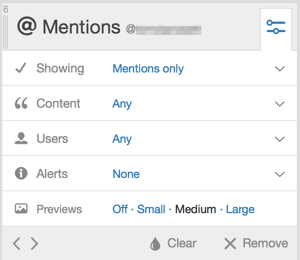 TweetDeck lets you engage, monitor, and schedule tweets for multiple accounts from a single customizable dashboard. 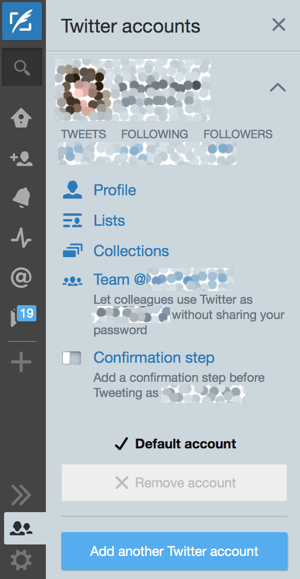 In this article you’ll discover how to manage multiple Twitter accounts with TweetDeck. 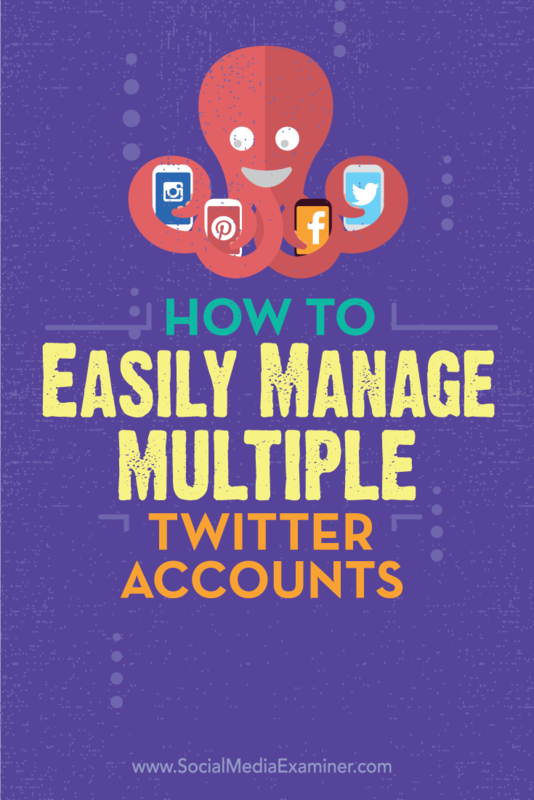 Discover how to easily manage multiple accounts on Twitter. The first step is to set up your TweetDeck account. If your company has one or two people monitoring social media, you can create one login using your company’s handle as the default account. Then you can add more accounts/handles to that same user login. After you log into TweetDeck, you’ll see your TweetDeck dashboard. Use the options in the left sidebar to navigate TweetDeck. The gray navigation bar on the left side of the dashboard is your go-to location for everything TweetDeck can do. From there, you can add accounts, write new tweets, review activity and notifications, read messages, change settings, and more. To connect additional accounts, click on the Accounts icon near the bottom of the navigation bar. Add accounts to your TweetDeck dashboard. Next, click Add Another Twitter Account and enter the username and password for each account you want to manage. Now you’re ready to begin. The most powerful TweetDeck feature is the ability to add streams, which are columns of tweets that are updated in real time. There are a number of different streams to choose from, such as User, Notifications, Mentions, Followers, Messages, Search, Lists, and more. To add a stream, click on the Add Column icon (with the + sign on it) in the navigation bar. Then select the column type you want to add. Select the stream you want to add. You can customize the content of each column and remove excess noise. This makes it easier to find the information you want. Click the icon in the upper-right corner of the column to access your filtering options. 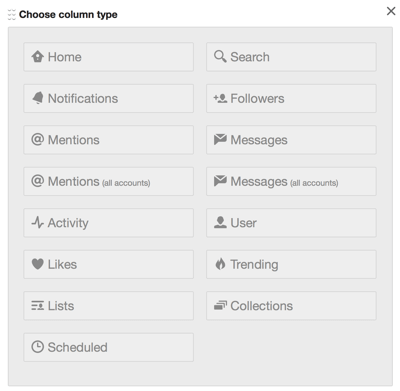 TweetDeck allows you to customize columns so you can see the information that’s important to you. Keep in mind that adding lots of streams isn’t always better. It’s important to choose the columns that will help you reach your marketing goals. Here are five streams that you’ll want to add. The Notifications stream allows you to see when you have a new follower, someone has added you to a list, or one of your tweets has been liked, retweeted, or replied to. Using this stream, you can quickly find active and potential clients, customers, and followers. Essentially it lets you monitor every handle that is engaging with your content. 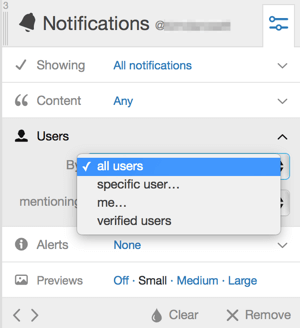 You can use additional filters to narrow down your notifications to engagement, users, and content type. Narrow your notifications by users. Add the Mentions stream to monitor every tweet that mentions your Twitter handle, whether for the first time or as part of a reply/conversation. The Mentions stream tracks tweets that mention your Twitter handle. By monitoring and using this stream daily, your marketing team can track every company mention, and then react in a timely manner. You can quickly jump into conversations, offer customer support, or engage with your existing user base or potential prospects. Search is one of the most important streams in TweetDeck. It allows your marketing team to go beyond users and monitor content related to keywords or hashtags. Using the Search feature, you can keep an eye on topics and conversations that are essential to your business. For example, if your company is about to launch a new technology product, your marketing team can set up a Search stream to monitor all tweets for keywords such as new technology, today in tech, #techtuesday, and so on. Set up a stream for a relevant keyword or hashtag. Bonus Tip: When setting up this stream, don’t forget to use Boolean operators to save space. This way, you can search for multiple terms in the same column. 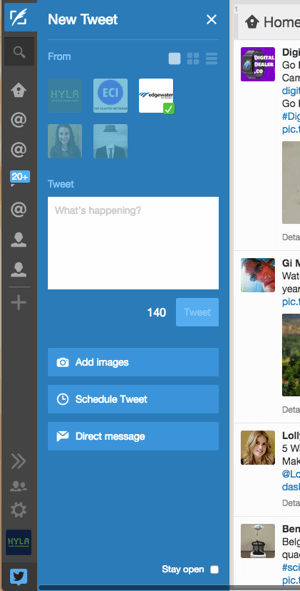 The Messages stream allows you to read and reply to direct messages for any accounts you’ve added to TweetDeck. This is where you can turn your Twitter following into real engagement with prospects and influencers in your industry. Once you have this set up, you can respond quickly and appropriately as the discussion occurs. 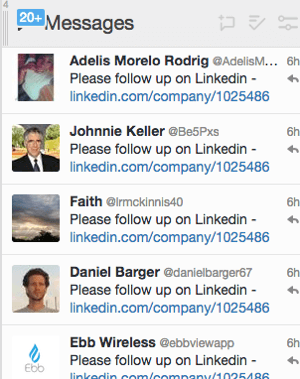 You can create a separate column to track direct messages for each account. Alternatively, you can track messages for multiple accounts in the same column by adding the Messages (All Accounts) stream. Add a stream to track direct messages to your Twitter account. Lists is a feature that you must first set up within Twitter. 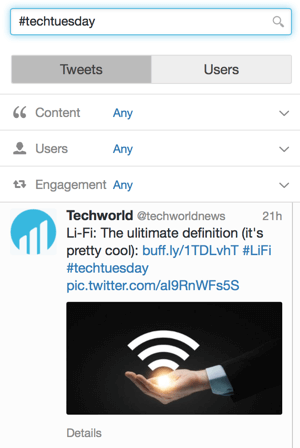 After you create your Twitter lists, you can pull them into TweetDeck. This allows you to add any Twitter handle (regardless of whether you’re following it) to a Twitter list and create a number of lists for specific purposes. Competitors: Watch out for new content, product launches, events, etc. Thought Leaders: Identify industry trends or get ideas for your next piece of content. Clients: Build relationships by sharing their content and creating discussions. 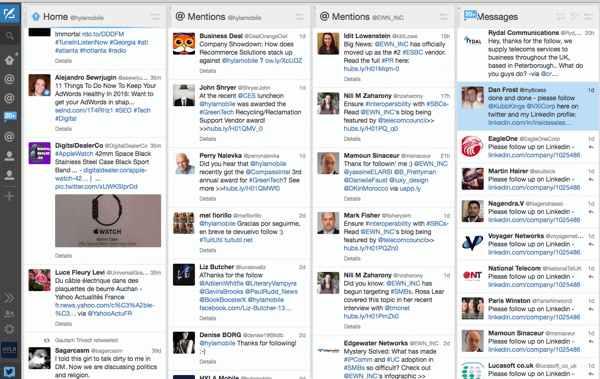 Once you’ve set up your TweetDeck streams, you have a complete view of your Twitter presence in one dashboard. To effectively manage and grow your Twitter account, you’ll need to do some daily tasks. To make sure no tasks or opportunities fall through the cracks, here’s a helpful checklist. 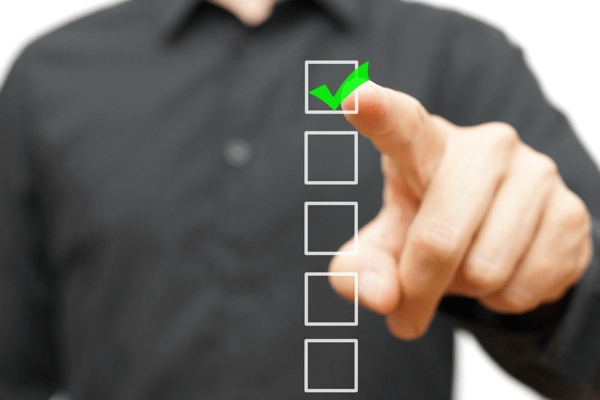 Use your dashboard to complete a checklist of management tasks efficiently. Image: Shutterstock. It’s important to monitor your mentions and messages streams closely. 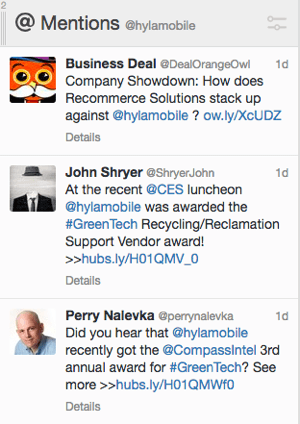 These are the people interacting directly with your company. Often, these tweets are customers trying to reach out for help, complaints, or praise. To keep your Twitter feed fresh and engage with people you’re following, retweet relevant content. You can find content worth retweeting in your Mentions, Lists, and Search streams. If a mention offers praise or an interesting story, retweet it. Your Lists and Search streams should also be set up to display industry-relevant terms and information worth sharing. You can schedule tweets (and add images) by clicking the New Tweet icon (with a quill on it) in the top-left corner. Click the New Tweet icon to compose a tweet. In addition to mentions and messages, aim to start new conversations with customers and industry leaders every day. To engage with potential customers and advocates, reply to their tweets, @mention them in one of your tweets, or direct message them. 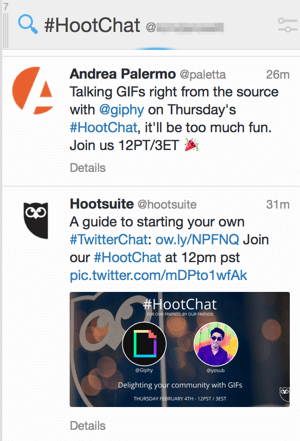 Another way to engage with customers and industry leaders is to participate in Twitter chats. Look for webinars, events, and other conversations relevant to your field. Most events will have a hashtag that makes it easy to sort related tweets. Save a chat hashtag as a Search stream to ensure you’re dialed into the conversation all day. Save the chat hashtag as a Search stream. Build your profile by following and engaging with new people. Be sure to follow people relevant to your business and industry by using the Notifications, Mentions, Search, and List streams. Look out for thought leaders and potential prospects. TweetDeck makes it easier to keep your company top of mind on Twitter by moving all your Twitter conversations into a single, customizable dashboard. Plus, when you can engage, analyze, monitor, and schedule tweets for multiple accounts from one place, you’ll be more productive. What do you think? Have you used TweetDeck? If so, how has it worked for your business? Please share your thoughts in the comments below. Tips on how to streamline your Twitter marketing when you have multiple accounts. Valerie is Inbound Marketing Director at Penguin Strategies, a B2B inbound marketing agency specializing in technology companies. She enjoys creatively promoting brands through content, social, email and influencer outreach.